Have you ever heard of the saying, “the fortune is in the follow-up”? It’s a really popular one in sales. Nobody seems to know where the saying originated or when, but there are literally millions of blog posts, articles, and videos created around it. In truth, where it comes from doesn’t matter, what matters is that it’s true. Only when you follow up do you really get anywhere in sales. Persistence is more important today than it’s ever been. In 2007 it took an average of 3.68 attempts to reach a prospect on the phone, by 2017 that number had more than doubled to eight attempts. And it’s not just these stats that point to the importance of following up, every statistic does. In fact, after having looked through dozens of studies and statistics (someone has to do it), all I found was info on why you must follow up and work on enhancing your lead response time to capitalize as soon as leads are sales-ready. Not one expert, guru, or kingpin salesman recommends giving up after one go. I can understand why people stop calling or emailing after the first attempt. If a prospect doesn’t take you up on your first offer you don’t really want to pester them. But pester them you must! You just have to be smart about it. By this, I mean contacting prospects with buying intent at the moment they’re ready to be sold to. With this smart approach in mind, here are four follow-up sales hacks that I want you to try. Sales automation is a game-changer. It means you can reach more people in less time — and by the law of averages, the more people you reach out to, the more sales you’re likely to make. Email marketing automation isn’t a new thing, but far too many people are using it incorrectly. A study by cited in this Mailshake post by Aman Thakur revealed that 70% of unanswered sales email chains stop after the first email, with only 19% going on to email a second time. So an email blast is sent out and anyone who doesn’t reply is sent to the scrap heap. I get it, you don’t want to come across as pushy or annoying. 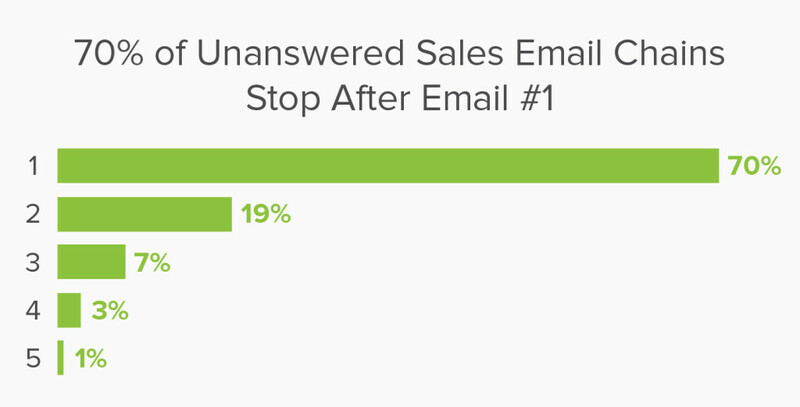 But consider this: the 19% of sales reps that go on to follow up have a 21% chance of getting a reply. And even after 10 emails, there’s a 7% chance of getting a response. Don’t just automate your initial email, automate follow-ups too. Mailshake makes it easy to do this by letting you create and schedule follow-ups at the very start of your campaigns. It’ll even stop the follow-up if the recipient takes action on the previous email. Doing it this way means you can follow up as many times as it takes without having to work your fingers to the bone writing out each email individually. How often should you follow up to get a response? The general rule of thumb is to send out a second email two or three days after the first, then four days after that, and a week after that. Check out Sujan Patel’s post on follow-up strategy for some great tips on how and when to send out that second, third, and fourth email. If your follow-up email has been opened, you’re on to something, there’s interest there. If the prospect has clicked on a link within the email and visits your website, you’re really cooking on gas. Because now — with the help of lead website tracking — you can qualify leads in real time and get alerted when a lead visits your website. This hack involves making minimal changes to your Mailshake email cadences with the simple lead scoring and website tracking tool SalesWings, so that you can see which pages a prospect is visiting on your site and gather enough rich data to decide whether you should get in touch. It’s like attaching a lead radar to your emails. When a prospect revisits your website — even if months have passed between visits — you’ll be pinged and can spring right into action. SalesWings looks at which actions have been taken, which pages have been viewed, and which links have been clicked. You can find out when the prospect has viewed a page and how long they spent on there. Because you already have their email address, you’ll also be able to pull up a profile that includes job title, social profiles, location, and company information. And based on the actions taken, the tool automatically ranks leads in order of relevance to give a clear insight into whether a prospect is worth pursuing now, later, or never. Take the data served up in the SalesWings dashboard to plan what to talk about with prospects and which actions to take when you follow up. For example, if you can see that a prospect is spending a lot of time looking at the features page, invite them to attend a demo where you can show them the features first-hand. If they’ve been inspecting pricing, talk about the value of your packages. Having your calls ignored is part and parcel of being a sales rep. Most people aren’t keen on answering a call from a number they don’t recognize, which is probably a big reason why 97% of calls go to voicemail. But when you call someone you need reach them as quickly as possible, because with every passing minute the chances of getting through at all diminish. 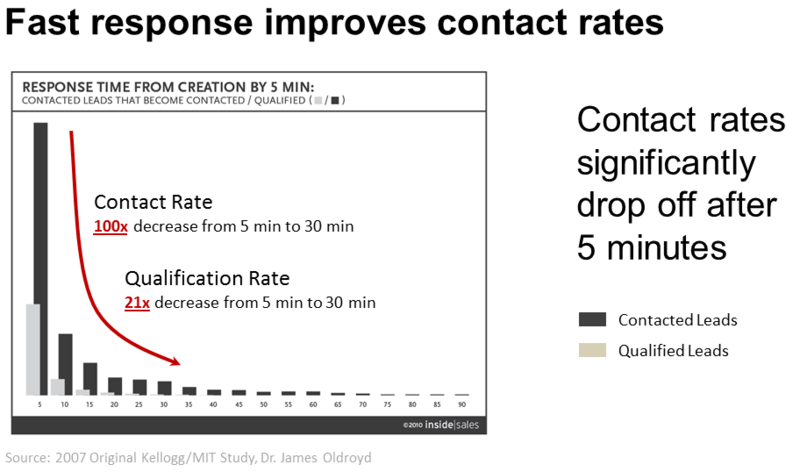 An InsideSales study shows that the odds of making contact with a prospect decrease 100-times if 30 minutes go by — and qualification rate decreases by 21-times in the same time period. If someone doesn’t pick up first time, try the double dial — call them back immediately. The second time the phone rings from the same number, curiosity is piqued: “Who is this? They’re calling back. It has to be important!” It’s a simple tip, but a tried-and-tested way to create urgency. I’d always recommend striking while the iron is hot (i.e. when website activity is showing you a hot lead) but it’s worth taking that data into consideration, especially when calls made at 16:30 show a 114% increase in revenues when compared to calls made at 11:30. The best moment to propose a meeting or product demo isn’t three months down the line, it’s today. NOW! Or if not today, tomorrow. Once a prospect has committed, schedule the meeting or demo right there on the phone and send a follow-up confirmation email immediately after the call has ended. When it comes to following up, the most important thing is that you do it. Yes, it takes more effort, but having Mailshake in your corner means that most of the heavy lifting is done for you. Combine this with website tracking to reach leads at the right time and just the right amount of urgency when talking to prospects, and you’ll soon start seeing positive results. Philip Schweizer is Co-Founder and CEO at SalesWings, a Switzerland based technology venture developing its sales and marketing alignment platform for sales and marketing teams. He spent the last 10 years building and growing technology start-ups in the SaaS space.